Try serving this healthy Zesty Soba Noodles for a light lunch or as a side to your favorite meat meal. This noodle dish is tossed with soy and sesame dressing. Really simple to make. Hope your family enjoys this recipe. Combine all the salad dressing ingredients and whisk well. When ready to serve, toss the chilled soba with prepared dressing, top with chopped scallions,some sesame seeds and roasted seaweeds. Yummolicious - I'd love to make this for lunch soon. Pinning!! Angie...Happy Mother's Day to you. Have a blessed one with your kids and hubby! I love soba/buckwheat noodles. My grandmother used to make me noodles similar to this. Looks delicious! Your photography is just as stunning as ever! I am back from a long hiatus (got my masters degree) and am back blogging again. Glad to see you are still posting yummy recipes and lovely pictures! Oooohhh! Yum! I love soba noodles! This recipe looks so simple, yet sounds so delicious! 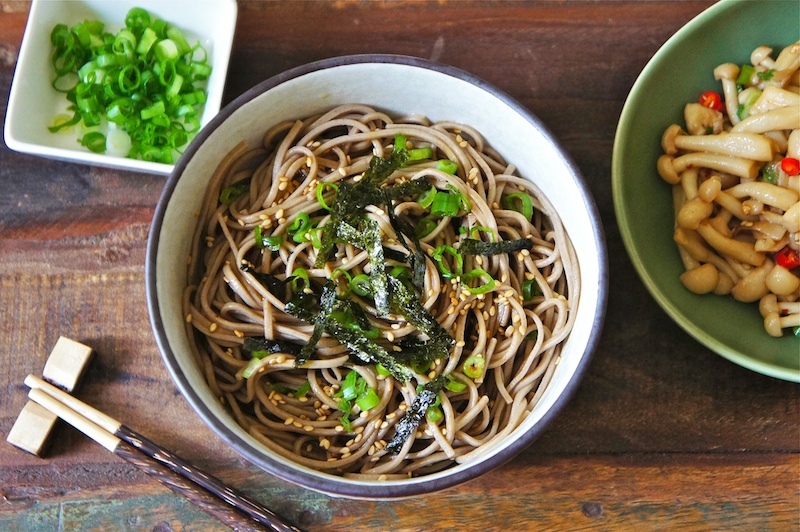 I've always been curious about soba noodles and this looks delicious.